The oceanfront, 1905 Historic Lund Hotel is located at the tip of BC's beautiful Sunshine Coast, at the Gateway to the renowned Desolation Sound. Since its construction by the Swedish Thulin brothers who founded Lund, the hotel has served as the heart of this quaint village. After having gradually fallen into disrepair in the latter part of the 20th century, the hotel was purchased by its current owners in 1999 and since then has undergone an ongoing series of restoration and renovation work that has allowed this lovely heritage building to shine once again. The hotel now features 31 renovated guest rooms that range from budget friendly units to lavish boutique style suites, all of which offer clean, bright decors and modern amenities expected by today's discerning traveler. 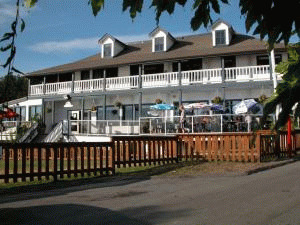 Our pub, restaurant and decks feature unobstructed ocean views and outstanding dining. Please visit Historic Lund Hotel Website.